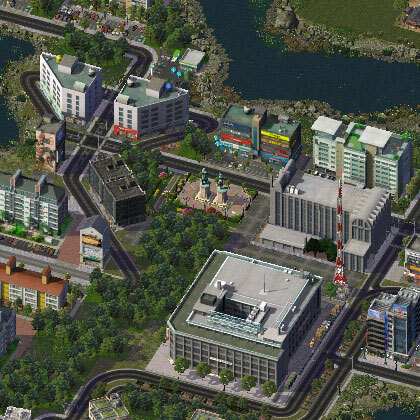 Welcome to my little site about the game I love most – Simcity 4 Rush Hour! Here you find all the stuff that I enjoy, building cities and City Journals, creating Custom Lots, and also sharing some of the little knowledge I picked up along the way. On the right is a little slideshow waiting for you – to sort of 'tune in' ;-)... You can shift the images manually with 'next' or just hit 'play', lean back and enjoy (6 sec per image). For more pictures visit the 'Images' section with various presentations and links to my City Journals. Don't forgot to check out my 'Custom Content' and feel free to download any or all of it. Give yourself two minutes to click around a bit to get a feel how this section is organized. To round things off there are sections with 'Links' to many important SC4-sites and download repositories, as well as some 'Tutorials' with tips and tricks. More hints about the site and some technotes can be found under 'About'. So just choose from the menue whatever interests you and dive in!